Dylan Shapiro is a contributing guest writer for CelebrityTypes. Shapiro previously alerted us to the possibility that Wilson was INTJ (and not INFJ as we originally thought). In this article, Shapiro furthers his case for Wilson as an INTJ. Shapiro originally wrote an article on why Wilson is INTJ with one of the site admins at a time when all parties believed that Wilson was INTJ. Since then, the administrators of the site have come to assess Wilson as ISTJ, while Shapiro still sees him as INTJ. Hence neither this article nor the original one can be taken to reflect the views of the site admins, but are provided here for readers wishing to familiarize themselves with the case for Wilson as an INTJ. Woodrow Wilson was a highly enigmatic president whose personality, ambition, ideology, and impact have all been debated without much consensus being reached. In the history world, the most common debate is whether Wilson was an idealist or a realist; as I detailed in my previous article, Why Woodrow Wilson is INTJ, the truth is neither, but rather somewhere in-between. Neither a starry-eyed idealist nor a down-to-Earth pragmatist, Wilson applied empiricism and the facts to his imaginative visions which as a result blurred his true ideology. Wilson tends to write and speak in a long-winded, meticulous, deliberate style that seems to attempt to methodically reach all facets (Si-Ne) rather than intensely reach one facet (Ni-Se). Wilson earned a degree in history, which, all else being equal, is far more Si-like than Ni-like. Wilson had a 99.2 percentile score on Conscientiousness [Reference #2], which is surprising given Ni’s characteristic “messiness” of thought. If Wilson were an INTJ, why does he seem to process information in a manner more reminiscent of Si? If Wilson were an ISTJ, why does he seem to espouse ideas that are more reminiscent of Ni? Just by glancing at these questions, the answer seems simple: in terms of mental processes, Wilson was an ISTJ; in terms of mental contents, Wilson was an INTJ. Thus, since Jungian typology is concerned with processes, not contents or behaviors, Wilson joins people like Sigmund Freud, Martin Heidegger, and Frederick the Great as intellectual ISTJs. But that assessment also raises some questions. Unlike Freud, Heidegger, and Frederick the Great, who are above all else straight-and-narrow administrative individuals who are not intellectual for interest’s sake but merely because it is practical to be so, Wilson was guided by intellectualism, vision, and imagination for his whole life. Why would an Si type’s life, taken as a whole, show signs of not only espousing INTJ-like views but also esteeming Ni-like methods of arriving at those views? A common mistake Jungian typologists make is to take every behavior, viewpoint, and fact about a person’s life as a sign of one or more of their cognitive functions. That is an error. Not everything about a person’s life is related to their Jungian type. To correct for this, one good strategy is to use a scientifically valid personality overlay, such as the personality styles, to differentiate between the function-related evidence and the “white noise” of a person’s style. Once that is done, it is easier to determine what is truly a facet of the cognitive functions, i.e. the personality type, and what is simply a product of the person’s personality style. Personality styles aren’t bound to specific cognitive functions. They don’t change the underlying mental processes of the functions. Thus, any type can have any personality style, though different types are more predisposed to having certain styles. Interpersonally Respectful (e.g., exhibits unusual adherence to social conventions and proprieties, as well as being scrupulous and overconscientious about matters of morality and ethics; prefers polite, formal and correct personal relationships, usually insisting that subordinates adhere to personally established rules and methods). Constricted Cognitive Style (e.g., constructs world in terms of rules, regulations, schedules and hierarchies; is rigid, stubborn, and indecisive and notably upset by unfamiliar or novel ideas and customs). Responsible Self-Image (e.g., sees self as devoted to work, industrious, reliable, meticulous and efficient, largely to the exclusion of leisure activities; fearful of error or misjudgment and hence overvalues aspects of self that exhibit discipline, perfection, prudence and loyalty). Concealed Object-Relations (e.g., only those internalized representations, with their associated inner affects and attitudes that can be socially approved, are allowed conscious awareness or behavioral expression; as a result, actions and memories are highly regulated, forbidden impulses sequestered and tightly bound, personal and social conflicts defensively denied, kept from awareness, maintained under stringent control). These five characteristics of the Compulsive personality style seem to be more consistent with ISTJ than INTJ, and yet, because any type can have any personality style, an INTJ could exhibit them. Given that, it is my assertion that Woodrow Wilson was an INTJ whose personality type was blurred by the Compulsive style and thus left him resembling, in many ways, an ISTJ. The Compulsive personality style, however, is not especially common in INTJs directly for cognitive reasons; INTJs have Ni-Se, which is characterized by wraithlike, subjective, imaginative insights (Ni) stressed intensely through the one perspective that will yield the greatest manifestation of that insight in the here and now (Se). That is opposed to the meticulous, partitioned, firmly structured filter of the Compulsive style, particularly its Compartmentalized Morphologic Organization, which is similar to the definition of Si-Ne with its tentative and multifarious nature. Wilson, as a young child, was “shy and imaginative,” but at the same time “awed by his larger-than-life … father,” who embodied the Wilson family’s “tradition of intellectual accomplishment” [Reference #2]. His father had “demanding” expectations of him – by “age four, [Wilson] was expected to express his thoughts in organized and proper English and was made to try again if he failed,” which, especially for an imaginative child, would have been highly stressful [Reference #2]. Yet rather than rebelling against the father whom he was “awed by,” the four-year-old Wilson sought to live up to his expectations. This pressure, which remained leveled at him for most of his childhood, is a likely cause of his Compulsive style. It is likely, therefore, that his father’s pressure and high expectations were the cause of Wilson’s Compulsion and that this Compulsion was in some way opposed to Wilson’s natural state. This opposition could either be (1) a result of Wilson’s Ni-Se axis being bound and shackled by Compulsion, which if true would make him an INTJ, or (2) a result of Wilson’s inferior Ne bubbling out, which if true would make him an ISTJ. Examining Wilson’s life, politics, and thought after correcting for his Compulsive personality, though, will in my estimation make it clear that he was an Ni-Se type, not an Si-Ne type. The most obvious sign of an N preference in Wilson is his relatively high score on Openness: the 64th percentile. While that is only slightly higher than the INTJ John Adams’s 61st percentile score, it is far higher than the scores of ISTJ presidents like George Washington (14th), Richard Nixon (14th), and Dwight Eisenhower (29th) [Reference #2]. Though Openness is not exactly the same as Intuition, as some S types can score quite high on Openness, it nonetheless is opposed to behaviors one would normally associate with inferior Ne. Ne is characterized by exploratory, springy, cognizant, inclusive examination of all conceptual possibilities. ISTJs, since their Ne is inferior, tend to be wary and skeptical of new, untested ideas and ingenuity, sometimes even to a fault. This usually leads to a very low score on Openness, as demonstrated by Washington, Nixon, and Eisenhower’s scores. If Wilson were ISTJ, this would be a notable anomaly for the type. Further evidence of Wilson’s openness to ideas exists in his idea-based and philosophical outlook on life. Steven J. Rubenzer, in his psychological study of Wilson, said of him, “He was exceptionally able to let his mind wander and had a very vivid imagination … he was … idealistic and spiritual … interested in topics of philosophy” [Reference #2]. Though Wilson was not a full-blooded idealist, he certainly had some idealistic tendencies; beneath his empirical approach to problems, he was imaginative, idealistic, and philosophical. As he said himself, “It is not men that interest or disturb me primarily; it is ideas. Ideas live; men die” [Reference #2]. His thought and motivation, while aided by logic, expediency, and empiricism, was brought about by imaginative insight, which is highly unusual for an ISTJ, but not for an INTJ. Additionally, Wilson’s political thought was highly influenced by the INTJ philosopher G.W.F. Hegel. So much so, in fact, that in a letter to his wife, he made it a point to mention Hegel’s influence on him: “[Hegel] used to search for, and in most cases find, it seems to me – the fundamental psychological facts of society” [Reference #5]. As discussed previously on this site, Wilson’s vision of the League of Nations was rooted in Hegelian teleology. This alone does not unequivocally prove Ni-Se over Si-Ne with unusually developed Ne, however. Wilson, from a distance, has many traits that seem more consistent with Si than Ni: His degree in history, his long-windedness, his love of bureaucratic organization in and of itself, and his lack of inferior Se vacillation between asceticism and indulgence. Up close, though, these traits all make perfect sense if Wilson were a Compulsive INTJ and at the same time bring to light more definitive traits that oppose ISTJ. All else being equal, Si-Ne types are better equipped for natural enjoyment of school and academia than Ni-Se types: While Si-Ne compartmentalizes a wide array of facts habitually into an extensive archive of memories and impressions, Ni-Se observes a narrower array of facts and intensely weaves them into a wraithlike image of interconnected ideas. Because of these dispositions, Si-Ne types are more interested in careful, procedural study similar to traditional academic practice: For example, ISTJ Natalie Portman “always liked school” and ISTJ Frederick the Great believed “knowledge of [an object] is to be attained … by careful and studious … particular and minute examination of it” [Reference #6]. Conversely, Ni-Se types frequently find traditional academic practice stultifying, preferring to make intuitive leaps from fact to idea to grasp the whole truth: for example, INTJ Stephen Hawking believed “that the ultimate theory will [not] come by steady work along existing lines” and INTJ John Adams “saw the whole of a subject at a glance” [Reference #6]. Yet both types have the capacity to succeed in academia; they just do so in different ways. ISTJs, having Si, are often more diligent, hardworking, careful, and meticulous in their study than INTJs. INTJs, having Ni, tend to be more “selectively studious,” or studious only when the studying contributes to their vision of the whole truth. Wilson, then, as the only president to earn a Ph.D., surely must have been diligent and meticulous, right? This academic style seems quite opposed to the ISTJ’s much more careful, meticulous approach and yet is wholly consistent with the INTJ’s vision-oriented, selective approach. In fact, this style seems inconsistent with Compulsion, too, but as an academic Wilson also “could master the rules of order with avidity, for they were to him a highly practical tool” [Reference #7] – hinting at the highly structured and orderly behavioral constraints on his selective studiousness. Taken as a whole, therefore, Wilson’s academic style as an undergraduate seems perfectly compatible with what we would expect of a Compulsive INTJ, but highly unlike what we would expect of a Compulsive ISTJ. Compulsion would actually serve to amplify the ISTJ’s already meticulous and careful approach, while with Wilson it serves to mitigate his lack of studiousness. Essentially, Wilson entered law to ultimately attain his ambition of becoming a “great statesman,” but when that goal required an Si-like method of study, he found it stultifying. The only thing keeping him sane and driven in such a detail-based environment was the solace that it was all for the benefit of his vision and his Compulsive personality style, specifically its Responsible Self-Image, which let him keep “good grace and a straight face.” His time at the University of Virginia was not wholly stultifying, however, for while there he was elected President of the Jefferson Debating Society. As its president, he “promptly revised [the organization’s] constitution” with “contagious enthusiasm,” and that constitution’s success “intensified his larger ambitions” [Reference #7]. Free from the constraints of the detail-based law study, Wilson was able to excel and enact reform in ways that he cared about passionately. That environment, along with the independence brought about by being in power, was the environment in which Wilson was most happy and most driven to excel – and it also was far more consistent with an INTJ’s preferred learning environment. After graduating from the University of Virginia, Wilson became a lawyer and he felt his career to be highly constraining. He longed for “intellectual companionship” [Reference #7] but could not adequately get it from being a lawyer. In fact, he was so intellectually stagnated that he showed a marked shift in his aspirations – the lack of intellectual stimulation broke him. Rather than continuing on the path he had originally planned for himself, he decided to get a Ph.D. in history from Johns Hopkins University, simply to “become a master of philosophical discourse” and therefore become a professor [Reference #7]. This was also consistent with his Ni-Se axis; he craved intellectual stimulation enough that it became his lifeblood, and the lack of it made him reconsider his career goals and change his vision entirely. At Johns Hopkins, however, he received a similar shock as he did at the University of Virginia. He wanted a broad philosophical overview of a wide breadth of history, but Johns Hopkins “was for specialists, not generalists” [Reference #8]. His studies consisted largely of memorizing details; the discussions consisted largely of exploring the minutiae of the historical happenings. He felt so oppressed by this detail-based environment that, in letters to his fiancée, he wrote, “I need not bore you about all this. I am sufficiently bored for the both of us”; “I find the school-boy task of cramming for examination increasingly irksome. I find my interest choked by … the innumerable dry particulars”; and, “I want to be near the world. I want to know the world; to retain all my sympathy with it – even with its crudenesses. I am afraid of being made a mere student. I want to be part of the nature around me, not an outside observer of it” [Reference #8]. He also disliked his professors, calling them “men who are pretending to teach” because of their procedural, detail-based teaching style [Reference #8]. These complaints all were the result of an Ni-dominant type who craved intellectual stimulation having an Si-style approach uncontrollably come in the way of his needs and vision. Few things are more frustrating to an INTJ than being uncontrollably oppressed; such an environment led Bobby Fischer, for example, to quit school at age 16. So oppressed was Wilson that he reached out to his father for advice, who then advised Wilson to focus his energy on writing a book he actually wanted to write: Congressional Government [Reference #8]. After Wilson wrote the book, the university took notice of him, ultimately granting him his Ph.D. on account of the book despite the fact that he never completed the requirements [Reference #8]. He then set off to be a professor, later rising to the level of university president and enacting reform there. As an enactor of reform, Wilson was “unmovable, refused to compromise, and was defeated” – a prelude to his struggles to get the U.S. to join the League of Nations [Reference #2]. In a broad sense, therefore, Wilson was a highly intelligent student who nonetheless exhibited all the hallmarks of an Ni-Se type in academia; he frequently felt oppressed by the Si-like nature of the actual methods while focusing much of his energy on his extracurricular visions. Though at first glance Wilson was the most academic president given his Ph.D., upon closer inspection his approach to academics was far more consistent with INTJ than ISTJ – and the occasional anomalies are in my view perfectly explainable with INTJ Compulsion, but not ISTJ Compulsion. But it is questionable that Wilson chose history as the method for intellectual stimulation. Could this be a sign that he liked history as an end in and of itself, something far more consistent with Si than Ni? Though perhaps it looks that way from a distance, if one truly examines Wilson’s perspective on history that does not seem to be the case. Because Si entails a careful, studious, laborious approach to learning while Ni entails a bold, wraithlike, selectively studious approach, Si types tend to be far more fond of and receptive to learning history than Ni types. Indeed, a curious phenomenon amongst Si types is that, due to their vast internal archive of data and memories, they can often believe the future will behave the same as it did in the past. Si types, therefore, can be said to plan against the future, looking to the past empirically and approaching the future in the manner the example set by the past dictates. Ni types, however, because of their frequent leaps from fact to inference and idea, tend to believe the future is ever-changing and fluid. Thus, Ni types tend to plan into the future, inferring new perspectives and pushing for change since, to the Ni type, the past does not hold all the answers. On the surface, Wilson exhibited an interest in history quite unlike that of an Ni type. Could it be that when Wilson said he craved “intellectual companionship” and to “become a master of philosophical discourse,” he actually was referring to a shackled Si function rather than an Ni function? Though perhaps deductively speaking that may make sense, if one really examines Wilson’s motives and approach to studying history, it seems to be false. Bagehot’s Physics and Politics, taken as a whole, suggests that customs and traditions, which he dubbed “cakes of custom,” are merely a product of the current society; the thing to do, therefore, is to “[break] the cake of custom…and [reach] something better” [Reference #9]. This philosophy espouses a form of cultural Darwinism: the best customs are those that remain, while the worst are replaced with something better. To know exactly how to reach better customs, therefore, it would be logical, even for an Ni type, to have a working knowledge of the past. But despite the fact that Bagehot’s philosophy is fundamentally progressive, it could still be interpreted as an Si-style plan against the future rather than an Ni-style leap into the future. Wilson himself said as much: of the book, he said, “[Bagehot] does not construct for the future” [Reference #5]. And this was Wilson’s main disagreement with Bagehot and where he began to embrace Hegelian thought. Hegel’s philosophy, unlike Bagehot’s, not only esteems a progressive outlook but also makes an intuitive leap into the future. Indeed, as Ronald J. Pestritto writes, “the primary difference between Hegel and the English Historical School is for Hegel, history is going somewhere” [Reference #5]. Hegelian historicism “has a particular future in mind, and progress is all about reaching it,” which appealed to Wilson more than Bagehot’s progressive yet cautious outlook [Reference #5]. Wilson, therefore, was interested in history primarily for its broad context and as a stepping-stone toward the future, not as an end in itself. This is an approach toward history reminiscent of Ni, not Si. Wilson, as a professor, also had an Ni-Se perspective on the job of the historian. In an essay, On the Writing of History, in which he wrote his definitive opinion on how history should be written, Wilson argued that the historian needs an imagination and needs to imbue his account with art so as to enliven it. But that alone could merely be Wilson’s Te explaining how a historian could make a product people would enjoy reading. Upon a close read of the essay, though, Wilson’s perspective is highly Ni-Se. Rather than elaborating on all the facets of history that the historian knows, he should confine himself to the most visceral, fascinating ones: the ones that would have been observable at the event itself. To Wilson, rather than providing a detailed and nuanced account, the historian should provide a visceral one that lets the reader’s imagination flow so as to ascertain the abstract “truth” of the events. These beliefs are highly inconsistent with Si, though they are quite consistent with Wilson’s philosophical outlook on history; Wilson does believe history is important, but for its ideas, not its details, and likely only to provide context for his vision of the future. With that, Wilson explicitly claims he opposes the “ordinary” [Reference #10] Si-Ne style mental process of elucidation exemplified by Frederick the Great: “Knowledge of [an object] is to be attained … by careful and studious … particular and minute examination of it” [Reference #6]. Woodrow Wilson’s belief that historians must tell the right truth is expected, given both the role of the historian and Te’s respect for the facts, but his overt disdain for the “ordinary” Si-Ne method of ascertaining that truth is inconsistent with Si – especially dominant Si. But indeed he never claims a historian should inject his own subjective perception of the events into the telling of the tale. This is an anomaly if one believes Wilson to be an Ni type. For evidence of that, one must look at his political ideology. As mentioned before, Wilson’s ideology was a synthesis of the English Historical School and Hegelianism. He was particularly attracted to Hegelianism, but not all Hegelians are Ni types; an Si type could theoretically come to the same conclusions. In his essay The Wilsonian Chimera, Stephen Wertheim discusses the true nature of Wilson’s vision for the future, and in turn reveals evidence that, for an Si type, would be both unusual and difficult to explain. 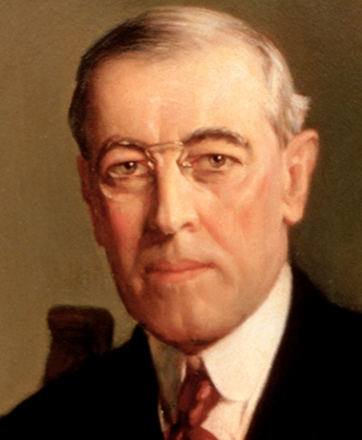 For example, according to Wertheim, “there is no evidence that [Wilson] ever studied the details of any foreign issue” prior to his Presidency [Reference #14]. Indeed, Wilson entered office with a thin knowledge of international events – a notable anomaly when one considers that his vision for the League was a culmination of the political philosophy he had developed as an academic. If he were an Si type, using past evidence to plan against the future, he would have been much more thorough and diligent when he came up with the idea for the League; indeed, Frederick the Great would likely have scorned Wilson’s lack of knowledge just as he did with Machiavelli and warfare. [Reference #6]. When Wilson entered office, however, he knew he had to have a working knowledge of international events to not be overly idealistic; as such, he “synthesized his internationalist tenets only during his presidency” [Reference #14]. Additionally, Wilson exalted what he dubbed “public opinion” (which is one of the reasons why, from a distance, he seems like an Fe type) but he meant “public opinion” in a non-literal sense. Wilson believed modern democracy “was not the rule of the many, but the rule of the whole” and therefore that public opinion was “the one national will, which is different from the average will of the multitude” [Reference #14]. How he believed leaders should ascertain this public opinion supports Ni and opposes Si; he believed in essence that “the general will was discerned through the introspection of enlightened men more directly than through the analysis of public preferences” [Reference #14]. Wilson did not include objective criteria for how a leader would go about this discernment, either. He believed it required “sympathetic and penetrative insight” – that is, in Wertheim’s words, “special intuition,” of which “scientific polls [would have been] valuable but not decisive” [Reference #14]. This view was paternalistic, and required the leader to do two things: ‘Interpret’ “the general will and [foresee] the future” – the latter of which Wilson believed to be an essential trait of statesmen. When he was young, he wrote, “Across the mind of the statesman flash ever and anon brilliant, though partial, intimations of future events”[Reference #14]. In fact, what Wilson dubbed “the spirit of the age” was actually Wilson’s own “intuition and prejudice,” which appeared to him “not as intuition but as objective truth” [Reference #14]. This solipsism did not shine through in the essay On the Writing of History but was nonetheless amongst Wilson’s defining traits – it was in many ways his biggest weakness, and it was a weakness Si types are not prone to. Ni types tend to be much more solipsistic than Si types. Wilson himself directly believed in much of this Ni solipsism, despite being a positivist – as Wertheim wrote, “Wilson … believed the spirit – singular – was out there and capable of discovery” [Reference #14]. Wilson’s Inferior Function: Se or Ne? When assessing someone’s type, it is also prudent to look at the inferior function. The inferior function, contrary to popular belief, is not weak, but rather unconscious and difficult to draw upon deliberately. Wilson, oddly for an INTJ, did not overtly demonstrate one of the hallmarks of inferior Se: a struggle between asceticism and indulgence. If Wilson’s inferior function appears to be Ne (rather than Ni) we might find ourselves back at the beginning: INTJ and ISTJ are again equally likely. Though Wilson did not overtly demonstrate the ascetic-yet-indulgent behavior we normally associate with inferior Se, that anomaly is wholly expected given his Compulsive style. One of the hallmarks of a Compulsive personality is Concealed Object-Relations, or the deliberate suppression of “forbidden impulses” so the exterior seems calm and rule-bound. In an INTJ, that would bind the inferior Se’s longing within and keep it in check; thus, it makes sense that Wilson would never have an “Se binge,” INTJ or not. A Compulsive INTJ would likely inwardly dream of and unconsciously esteem Se-like views but rarely act upon them himself. Upon close inspection, one finds ample evidence of Wilson’s inferior Se; it just is a highly distorted and restrained breed of it due to his Compulsion. And correspondingly, one finds little evidence of inferior Ne. Se is characterized by a photographic, experiential, tactile method of experiencing the world; Si, by contrast, is characterized by impressionistic archival of habitually learned impressions and memories. As mentioned above, Wilson was afraid of becoming a “mere student” because he wanted to “be part of the nature around [him], not an outside observer of it”; he did not want to become overly educated because he would lose the tactile, experiential connection with the world he had before he was a student. Additionally, as mentioned above, Wilson believed the best historians only told the most visceral facts so that readers would feel like they were there and could, in turn, best grasp the abstract meaning of the events. If he were an Si type, Wilson would’ve preferred a wider array of facts so he could, after close study, impressionistically visualize the scene based on his own cataloguing of the facts. This demonstrates Se as well; because the old generation had lost a visceral, tactile connection with the “creative, formative, and progressive forces of society,” Wilson believed in making the newer generation unlike them. Even though, as Wilson admits, the old generation can be intelligent, knowledgeable, patriotic, and of good character, Wilson still believed their ways must be left behind for the sake of progress – simply because they lost the tactile connection with society. An Si type, inclined to believe the past behaves similarly to the future, would tend to disagree with this. Another characteristic difference between inferior Se and inferior Ne is their attitude towards change. While Ni-Se is characteristically bold and open to new experiences, Si-Ne is characteristically cautious and skeptical of new and untested ideas. Again, because Wilson was a Compulsive, this distinction is somewhat blurred in him; a notable facet of Compulsion is a Constricted Cognitive Style (i.e. a hierarchical, rule-bound construction of the world notably upset by novelty). Thus, if Wilson were an ISTJ, this would amplify or coexist with his inferior Ne, but if he were an INTJ, this would mitigate the boldness brought about by Ni-Se. Though Wilson was conservative on many issues, including race and women’s suffrage, he was ideologically bold and future-oriented on the issues that truly mattered to him. Indeed, he changed his views on women’s suffrage because he believed it a necessary war measure, which hints at the fact that his conservative views were not of utmost importance to him. On topics concerning his vision, however, he was highly progressive and future-oriented, bold and wholly unconcerned with tradition or the tried-and-true. On any issue that really mattered to Wilson, he was open to the new. As a man open to imagination and new thought, Wilson wanted to appoint someone with a big imagination; if Wilson had inferior Ne, we might conjecture that his prime concern would have been the man’s practicality, capability, and dedication. And because Lansing was not imaginative, he was at a perfect vantage point to observe and notice a hallmark of INTJs’ inferior Se: tunnel vision. Because his Ni had convinced him irrevocably that he was correct, Wilson had a distorted perception of the factual reality of the situation. He was so driven by his subjective ideas that he became unknowingly world-denying, something a less imaginative but more factual man like Lansing would take notice of and criticize. Though Wilson, as a Te type, used the facts and empiricism as stepping-stones for his vision, he was often seized by tunnel vision and could distort the facts unknowingly to fit the idea. Now that a case for INTJ has been erected, I will attempt to falsify the opposing case for ISTJ. Despite the wide array of INTJ evidence I have supplied, it is still not wholly out of the question that Wilson was an example of an intellectual ISTJ. Indeed, there are notable examples of precisely that: Sigmund Freud and Martin Heidegger. From a distance, both Freud and Heidegger seem like INTJs; up close, though, their Si-Ne axis is revealed. Wilson was very different from both of them. Freud and Heidegger were, for the most part, straight-and-narrow administrative individuals more concerned with practical logistics than intellectual speculation. Both of them disliked philosophy – Freud said he “lack[ed] a talent for philosophy” and found “its abstract nature … unpleasant” [Reference #6]. And Heidegger, despite being a philosopher himself, denied that fact entirely, saying, “the fundamental mistake [in interpreting my work is that people regard me as a] creative and profound philosopher. … I am no philosopher. I do not think that I am doing anything remotely comparable [to philosophy]; that is not my intention” [Reference #6]. In a broad sense, Freud and Heidegger were “reluctant intellectuals” – highly intelligent but wholly practical men who were intellectual simply because they needed to be. Wilson, on the other hand, craved intellectual stimulation and esteemed philosophy highly. As just two of many examples of this, he said, “I can never be happy unless I am enabled to lead an intellectual life” [Reference #7] and he called “the bulk of mankind,” or those he deemed unworthy to vote, “rigidly unphilosophical” [Reference #13]. In the world of Jungian typology, there is a marked bias against sensation. Many believe that N types are “S types with an extra layer” – they believe both N types and S types are capable of the S-style fact-based, detail-oriented, trees-to-forest approach, but that only N types are capable of the imaginative, idea-based, big-picture approach. This is an error. But it is also possible to overcorrect for that and inadvertently call S types “N types with an extra layer” – the reverse of a bias against sensation. The S/N dichotomy, after all, is a question of preference, not ability; as explained above, though Freud was extremely capable of thinking abstractly in a manner many associate with Ni, he was above all else an experience-based, fact-driven “reluctant philosopher.” He still had a preference for sensation despite his ability for abstract thinking. The opposite is true of Wilson. He held the facts in high esteem and spent much of his political career developing practical solutions for practical problems – much like an ISTJ – and yet still above all else was an idea-based, imaginative, big-picture intellectual; anything but reluctant. Thus, one could say that while Wilson was extremely capable of thinking practically, he still was an imaginative individual at heart. In many ways, Wilson is to INTJs what Freud is to ISTJs. Assessing both to be ISTJ, therefore, seems to inadvertently purport a bias against intuition – Wilson, in broad terms, demonstrates a preference for intuition, not just a capacity for it. If we assert that Wilson and John Adams were INTJs and contrast them with Washington, Coolidge, Nixon, and Eisenhower as ISTJs, notable differences arise. Wilson and Adams were both imaginative men who were contemplative and introspective and esteemed ideas highly. Even though Adams said, “I would not advise any one to study [philosophy] longer than to convince him that he may devote his time to more satisfactory and more useful pursuits,” [Reference #6] he was highly contemplative and “enjoyed pondering abstract ideas” [Reference #2]. Wilson, in fact, was even more intellectual than Adams on this point, for Wilson esteemed philosophy quite highly as long as it remained useful and relevant to his vision. In short, Adams and Wilson prioritized ideas over experience. Contrast that outlook with the ISTJ presidents. David Greenberg said of the ISTJ Calvin Coolidge, for example, “[his] preference for experience over ideas was a deeply rooted trait” [Reference #6]. This is a recurring trait amongst most ISTJs. And while Wilson and Adams had definite visions for the future, Washington, Nixon, Eisenhower, and Coolidge all esteemed conduct that prioritized duty and responsibility: in other words, they planned against the future. For example, Washington gave up the Presidency after two terms, setting a precedent of honor and moderation; Coolidge “sought above all to instill his code of discipline, diligence, and responsibility” [Reference #6]; and Eisenhower urged the public to “avoid the impulse [of living] only for today, plundering for our own ease and convenience the precious resources of tomorrow” [Reference #6]. Nixon, when asked what he thought of intellectuals, said, “basically, they have no morals” [Reference #6] – a statement Wilson, who craved “intellectual companionship,” would likely take offense to. Yet even though Wilson is far more similar to Adams than to any ISTJ president, there is one example of a philosophical ISTJ leader: Frederick the Great – and Wilson greatly admired him. Both Wilson and Frederick, in their youths, were imaginative individuals, and both, as leaders, were interested in philosophy; Frederick the Great, indeed, wanted to reign like a Platonic philosopher king. At first glance, Wilson and Frederick seem highly similar, both in their imaginative nature and their practical application of philosophy. But upon closer inspection, Wilson appears guided by his imagination and insight, does not make specific note of the practical limitations of the philosophy he reads, and seems to plan into the future, while Frederick is practically minded, only esteems philosophy when it is practical, plans against the future, and is imaginative only as a hobby, not as a way of reaching conclusions. Notably, while Wilson was enamored with Hegel and Bagehot to the point that he “religiously” clung to their ideals even when they were impractical, pointing out only Bagehot’s lack of futurist vision as a notable complaint, Frederick the Great was quick to point out practical flaws in philosophers he read, saying of Machiavelli, for example, “if you examine [what he says] carefully, not one of his proposals is reasonable or right” and that he “gives many exciting rationales for his policies, but we look in vain for him to produce arguments that agree with sense impressions of our own” [Reference #6]. Additionally, Frederick the Great believed in “careful and studious … particular and minute examination” of objects to determine knowledge of them while Wilson believed in broad, visceral, imaginative elucidation of the ideas behind the objects. And while both Wilson and Frederick had the capacity to be creative, Frederick did so as a hobby and left it out of his political solutions, while Wilson was guided by imagination and used the facts as stepping-stones toward his creative vision. A final point of interest is that while Frederick always made decisions based on thorough, full knowledge of the facts at hand, Wilson was prone to suffering from tunnel vision while achieving his singular goals, sometimes to his detriment. Wilson, therefore, not only had the ability to think abstractly, but also had a preference for it, sometimes even at the expense of factual accuracy. Though he had a notable respect for the facts, empiricism, and efficiency, being a Te type after all, he did not approach them as an Si type would. Two final anomalies in Wilson’s personality must be mentioned: His long-winded writing style and his inherent love of bureaucratic organization have yet to be addressed. Both of these traits are more consistent with Si types, all else being equal, but nonetheless can easily be explained away with his Compulsive personality style. Also unusual is Wilson’s inherent love for bureaucratic organization. As a child, he greatly enjoyed constructing elaborate systems for his own made-up organizations – not because he wanted to achieve a specific goal, but simply because he “liked the sense of belonging to an organization” [Reference #1]. He also delighted in creating specific rules regarding misbehavior in his organization and fining people for disobeying them. Such behaviors tend to be associated with Si-Te, given the latter’s preoccupation with systemization and the former’s interest in particulars – but, again, they are not beyond an INTJ, especially not a Compulsive one. The Responsible Self-Image facet of Compulsion adequately explains why Wilson would have liked belonging to an organization for its own sake – it gave him an aura of focus, diligence, and respectability. And the Interpersonally Respectful facet explains why he wanted clearly delineated rules for behavior: he was merely “insisting that subordinates adhere to personally established rules and methods” [Reference #3]. Given that these traits, while unusual for an INTJ, can be adequately explained by Compulsion, it seems short-sighted to take these two anomalies as signs for ISTJ while ignoring the plethora of INTJ-related evidence that crops up in all facets of Wilson’s life. Woodrow Wilson was introverted and had a Te-Fi axis with Te at the forefront. Therefore, the only feasible possibilities are INTJ and ISTJ. Wilson also was an example of the Compulsive personality. Thus, the two most reasonable hypotheses are (1) Compulsive INTJ and (2) Compulsive ISTJ. Let us examine the most obvious facts: Wilson was imaginative and esteemed imagination; he was philosophical and voraciously read philosophy, most agreeing with the progressive and futurist but not especially practical views of Hegel; he found traditional academic practice highly stultifying; he changed his career due to lack of intellectual stimulation in his current field; he believed a historian should write history artfully to suggest, via imagination, the abstract meaning behind the facts; he did not like facts for their own sake; he developed his ultimate political vision without much knowledge of context; he believed the ideal leader was one who intuitively guessed the public opinion and had flashes of insight for the future; he was inadvertently solipsistic because his own intuitions appeared to him to be objectively true; he sometimes became too dogged and got tunnel vision as a result; he liked bureaucratic organization as an end in and of itself; and he wrote in a long-winded, smooth, partitioned style. There are several explanations for many of Wilson’s ISTJ-like traits, including his Compulsive personality style, his chosen career path, and his lengthy time in academics. But if Wilson indeed were a Compulsive ISTJ, how does one explain the bulk of his INTJ-like traits? Most of them are left unexplained. Since Jungian typology is semi-scientific, the best type assessment should be the one most resistant to falsification. Though neither INTJ nor ISTJ fully encompass Wilson’s entirety, INTJ is in my assessment the better fit of the two. When one views Wilson’s life as a whole, the most obvious trait is his very clear personal ambition, goals, and vision. Every decision he made can be viewed as a stepping-stone on a path toward a clear grand goal; every viewpoint he espoused can be viewed as a part of his political philosophy. Ultimately, as Steven J. Rubenzer puts it, Wilson was “a visionary, a man ahead of his time,” who nonetheless dreamt of an attainable future and worked toward that goal empirically. But his stubbornness, tunnel vision, and sometimes self-destructive drive ultimately got in his way. Thanks for a well-written contribution to the site. No doubt, we will not reach agreement, as we have already failed to do so after extended discussions. We appreciate that you have read extensively about Wilson, that you take care to argue your case and to do so from several different angles, and that you demonstrate awareness of how personality styles can confound the study of personality type. 1: Like the Wilson biographies themselves, this piece tends to gravitate towards broad, “fly-by” interpretations of Wilson’s life. As far as we are concerned, this is the overarching issue that we have with the piece. This really is the big one that (in our opinion) troubles the piece from start to finish. Far too often we are *told* that Wilson did or thought something without necessarily being *shown* it. At times, the piece reads like an INTJ checklist applied to Wilson in a vacuum (e.g. “Wilson was guided by imagination and used the facts as stepping-stones toward his creative vision … Wilson was prone to suffering from tunnel vision while achieving his singular goals, sometimes to his detriment.”). Another example would be in the passage about Wilson’s attitude to the study of law. Often, the piece seems to present salvos of Ni watchwords and checklists accompanied only by very remote pieces of evidence. We don’t mean to sound mean here, because this is a very hard genre and we wouldn’t have published the piece if we didn’t think it had merit. But zooming in more on the mechanics of particular instances would make the arguments more cogent. 2: At times the functions are taken overly literally. E.g. when the piece says that Ni types should advocate inserting a subjective perspective on things, this is not necessarily consistent with the phenomenology of Ni types: Because the subjective perspective is unconscious in an Ni type, they will not necessarily recognize that they are distorting things. Indeed, Ayn Rand thought she had penetrated to absolute truth, to give but one example. 4: Some of the quotes provided seem to say the inverse of this piece’s interpretation of them. E.g. the one on generations and the one on collecting facts. 5: The “rule of the whole” is from Rousseau and the spirit “out there and capable of discovery” is just Hegelism. Hegel was all the vogue at British and some American universities ca. 1850-1910 and made university students of all psychological types spout Ni-ringing philosophy for a time. 6: Naturally, “Intuition” etc. when spoken of outside of Jungian typology is not the same as when spoken of with regard to Jungian typology. We’re sure you agree. 7: Wilson need not binge to have inferior Se; he could also behave ascetically; something which we would expect to be magnified if he was indeed Compulsive. But Wilson was not an ascetic; the archetype was only born during the peace proceedings following WW1. Before that, he prized leisure, but of a rather “ordinary” kind: He enjoyed napping, long lunches, and slow-paced automobile drives. 8: The 1912 campaign speech example of why Wilson should have inferior Se seems dubious to us: As the piece says, the inferior function is unconscious. But then the piece cites an instance of *conscious* mental *contents* as evidence for inferior Se. 9: The piece seems to rely, in part, on a conservative/progressive understanding of politics, and to partly equate progressiveness with N and conservatism with S. The idea of viewing politics through a conservative/progressive lens is in itself highly politicized. Milton Friedman thought of himself as a progressive too. In many ways, it is also too simple because a sizable portion of the pundits and policy wonks on either side tend to be N.
10: In the same way, maybe it’s just us, but the piece seems to be a bit biased against Sensation in some places (?). It seems to imply that Si types have a propensity to accept the tried-and-true wholesale and that a predilection for innovation suggests N in itself. 11: In the conclusion, when the piece says that everything Wilson did was in service of a goal, this seems like an overstatement: As the piece also touches upon, Wilson was bewildered and confused about his future as a student. Likewise, he had not, at least according to our research, expected to become president, but rather caught a gust of political up-drift where one thing led to another within a very short period of time. 12: The piece conjectures that we might have such a thing as a bias against intuition. Actually, we agree that we probably have a slight “bias against Ni” in the sense that a lot of visionary people are automatically pegged as Ni types by people with little knowledge of the system and/or who suffer from wishful thinking (believing Ni to be the “best” function, they identify themselves and their heroes as such). However, the piece seems to misunderstand Sensation/Intuition (at least as we use it) when it argues that Wilson must have been an Intuitive because he was “idea-based, imaginative, big-picture [and] intellectual.” Of all of these, only ‘imaginative’ can be said to be truly indicative of N (in our opinion) and the rest we would chalk up to bias against Sensation. Readers should always remember that the ISJs presently on the site only reflect the subset of their type that is famous; on most universities, it will be possible to find more than one idea-based, big-picture intellectual who is an ISJ type, at least in our experience (as well as in the experience of V.W. Odajnyk, who was a lifelong Jungian, working at universities). 13: The piece seems to imply that someone who follows their philosophical inspiration (/authority?) vehemently is N while someone who notes its practical limitations is S. But by that standard, Nietzsche might be said to be an S. As of course John Adams would be. 14: However, overall we think you did a good job and you’ve clearly researched the subject matter to an admirable degree.